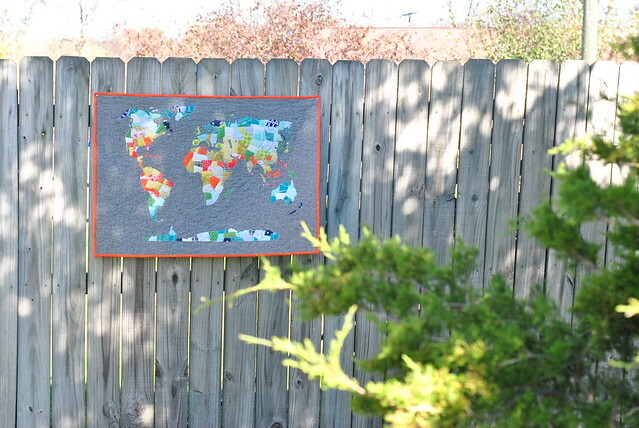 I shared some sneak peeks of this on Instagram, but I'm glad to say that my world map quilt is finished! I have really had fun with this scrappy applique method, which I also used in my Indiana quilt and Tennessee quilt! I used a variety of scraps for the continents, black Essex linen for the background, and an orange Carolyn Friedlander print for the border. Thank you to all who helped me decide on the border color on Instagram. I always have a hard time choosing! 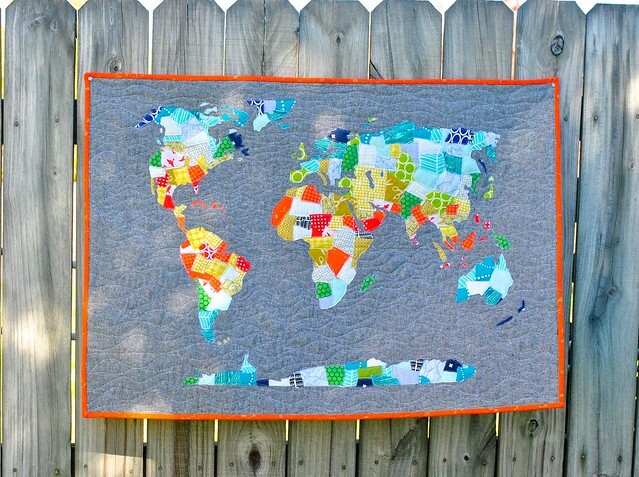 This is the "Around the World Quilt" pattern from Shannon Brinkley's book Scrappy Bits Applique (Stash Books). You can see her original above. Isn't it just amazing? Shannon teaches workshops on how to make this quilt. I appreciate her suggestions to make it as complex or as simple as you'd like. After tracing and cutting out all of those little islands, I'd probably skip quite a few of them next time around! Thanks for checking out my latest finish! What's on your sewing table right now? Are you getting gifts ready for Christmas? Love it so much! I really want to do a TN quilt! In guild preferably, with you leading the charge! I love it!! It's gorgeous!!! Lindsay this quilt is awesome. Love the orange binding.